The Abbot of Malmesbury and Bishop of Sherborne, Aldhelm wrote 'About Virginity' ('De Virginitate') in two versions. He wrote the first about 705 in prose for Abbess Hildelith and the nuns of Barking. A few years later he produced a poetic version of the work. This manuscript presents the prose version and a copy of one of his letters. 'About Virginity' concerns purity as a Christian virtue. Aldhelm created elaborate allegories in which early Christian male and female virgin martyrs appeared as warriors and athletes triumphing over evil. He wrote Latin in a notoriously difficult style, packed with obscure figures of speech and grammar. Despite this, 'About Virginity' was still being copied centuries later. This copy belonged to the Cistercian Abbey of the Blessed Virgin Mary at Newminster, Northumberland. 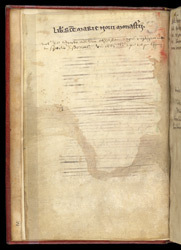 The back of the manuscript's first page has an ownership inscription, recording that the book belonged to 'The New Monastery [Newminster] of St Mary'.